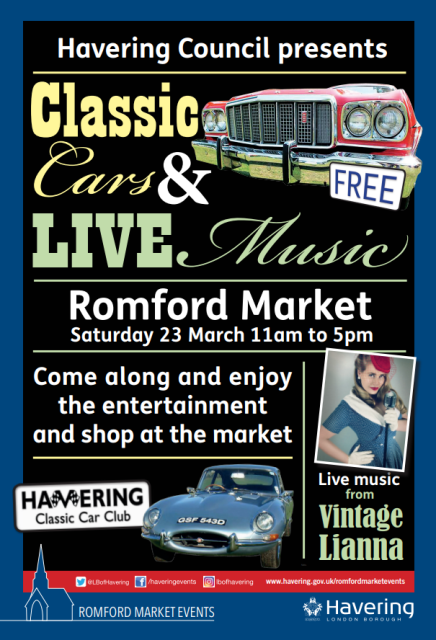 Classic cars will be admired to the soundtrack of musical hits from the 1950s and 60s in Romford Market as part of Havering Council’s series of events and activities to support traders by encouraging visitors to Romford town centre. The Classic Cars and Live Music event takes place on Saturday 23 March from 11am – 5pm. The event will play host to a large collection of cars from the Havering Classic Car Club, a local community of enthusiasts and collectors. The cars on show will take regular shoppers and visitors on a trip through time and may evoke some fond memories. The event will be a great day out for the whole family, with live entertainment from vintage hits singer Lianna Hayes, who will be performing classics from the 1950s and 60s including songs by Connie Francis to Elvis Presley. Lianna will be performing at the Tollgate House end of the market at 11.30am, 1pm and 2.15pm. “Romford Market is at the heart of our borough, and a trip down memory lane with classic cars and vintage music is a great way to celebrate that historic role.